I have been MIA this week due to being under the weather and spending a lot of time at hospitals and doctor's offices. Hopefully that will be over soon. 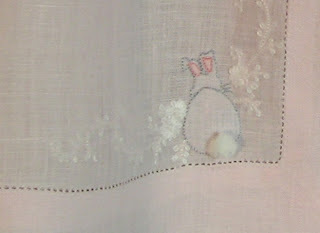 On to the subject at hand; sweet bunny tails. Remember I love linen. And pair it with adorable fluffy bunny tails and you have almost heaven. 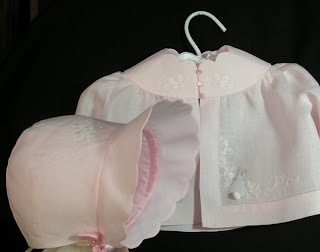 This is the finished matinee jacket and bonnet set I gave you a sneak peek of in this post. It is a class called "Baby's First Outing" and it was taught by Wendy Schoen at this year's SAGA convention. Shadow work bunny bottoms with turkey work tails. Embellished with embroidery of back stitch, lazy daisies and French knots. Stitched with DMC floche. Quite simple really. The jacket hem is pin stitched. Somehow instead of being finished first it was edged out by the baby gown. But I love this set. I love this bonnet. 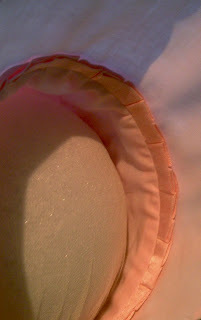 One of my favorite things is the silk satin ribbon that is ruched under the brim. Very nice touch. It is kind of fiddly to do but the effect is so sweet. Can't you just see a sweet baby face peeking out from under this bonnet brim? This set is sized newborn to 6 months, so that is a baby in arms or often over mom's shoulder. So as a treat the back yoke is embroidered too. The same embroidery is on the bonnet. Slow down, there isn't a race, the slower you go the more accurate you can be. Use a straight stitch foot. I have never been one to use a straight stitch foot much until recently, but I can tell from this project it does give you more control. Use a very small stitch length. I used a 1.5 stitch length. I traced the seam line on the pieces instead of trying to eyeball the raw edge with the markings on the bed of the machine. I was able to follow my traced lines. Clip, clip, clip! You can't be afraid to clip up to the that stitching line, coming within 1- 2 fabric THREADS of the stitching. It is one of those physics things again. If you don't release the pull on the fabric it won't turn to the right side without having puckers and tucks at the seam line. 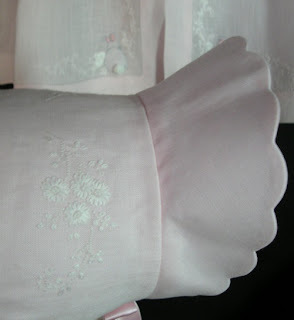 As you stitch each scallop turn your fabric as you are stitching, try not to stop and pivot. Try to stitch each scallop, turning and stitching without stopping. You will get a smoother stitching line. There are a couple of scallops that aren't as rounded as I would like and I think that is what happened. Just as important as clipping is press, press, press! I don't know why so many people, especially young or new sew-ers don't realize or value the importance of an iron. I still am not happy with the pressing on my bonnet. I want slick smoothness without a crinkle to be seen. I have learned over the years that most mistakes and missteps can be cured with an iron and I learned very early on, if you press as you go, the better the final product will be. Then when you are finished, press, press, press some more! And starch! I love me some starch. So enjoy this sweet jacket and bonnet. I have to go clean up my mess then decide what to move onto next. There is an advantage to being stuck at home, you get a lot of stitching done. I do know one thing, I need to pull out some boy UFO's. I tell you I am going to have a softball team of boy grandchildren when they start coming if I don't sew a few blue things. My kids are pretty on board with my dressing future grandchildren. 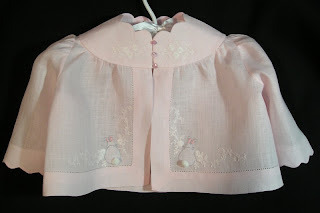 I think they may squawck if I try to dress baby boys in pink linen though. No matter how much I love pink linen. I'll get that famous nodding up and down of the head as they stuff it in a drawer never to be seen again. And that would not make mother happy. This is beautiful, and your scallops look wonderful. I excpect no less, when I see your finished projects. You are on a roll, two finished SAGA projects from the current year! Yeah YOU! That is really cute mom! Not sure about the bonnet. I would have a kid wear it for you though... for a little while anyways. How wonderful! Every detail is scrumptious and beautifully executed. 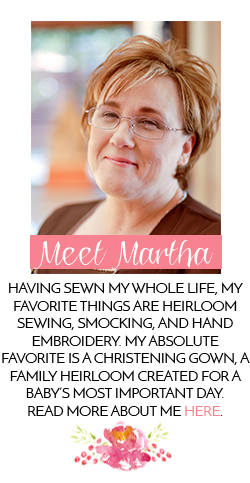 Gorgeous Martha!!! Thanks for sharing!! I'm pretty sure I know the answer to this question, since I've take a few classes with Wendy, but is the pin-stitching done by hand? I think I want to be you when I grow up too! Thanks everyone for the wonderful compliments. It isn't why we do what we love but it is nice to hear others say so.